Seattle Beer Week kicked off last night and runs for the next ten days. Dozens of events across the city and in the surrounding area will celebrate our outstanding beer culture. Granted, Seattle Beer Week is not about Seattle-brewed beer, but it could be, and maybe it should be. That’s my opinion, anyway. It’s now a matter of fact, Seattle is the top city in the USA when it comes to breweries. A report recently published by Datafiniti reveals that Seattle has more breweries than any other city in the country. The Seattle MSA (Metropolitan Statistical Area) is now home to 174 breweries. This was determined by analyzing data provided by the Brewers Association. Of all the reports I’ve read, this one seems the most thorough and straightforward. Too often these types of things are just lists based on opinion, arriving at conclusions the author hoped to find. Datafiniti explains their methodology and notes some of the challenges of interpreting this kind of data. They draw some obvious conclusions based on the data, not opinion. You can read the report here. Instead of staying within city limits, Datafiniti looked at Metropolitan Statistical Areas. For instance, instead of looking at San Francisco proper, they included the surrounding cities in the Bay Area. For Seattle, they included what we we would call the Seattle-Tacoma area. Among other top cities for breweries, Chicago ranked second, followed by Denver and Portland. In addition to analyzing which cities have the most breweries, Datafiniti also examined things like Most Breweries per Capita (by state), where Washington ranked sixth. We have 4.6 breweries for every 100k people. Impressive. 174? Is there a list as that seems way too many for just Seattle. 174 in the Seattle-Tacoma metroplex does not at all seem too high to me. There are nearly 60 within Seattle city limits alone. Nearly 350 in the state. You can use our maps and do the math yourself if you like. Feels good to say, but is a misleading detail. I believe a per capita number is more telling here, as you’ve noted with states. 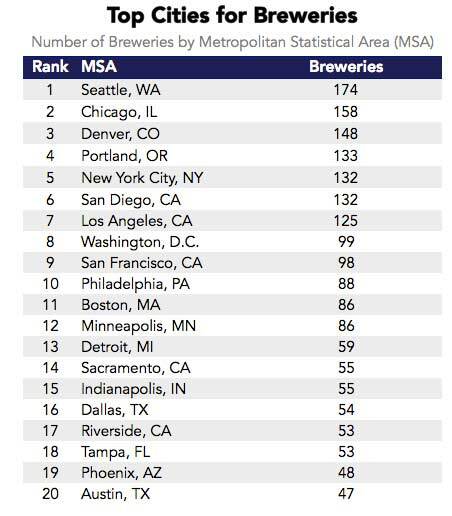 Sadly, Denver and Portland leaving Seattle in the dust, but this feels right based on anecdotal evidence and now Census and Brewers Alliance data. Kendall did not conduct the study. He did not publish the report. He did not decide to use MSAs instead of city limits. But I get your point. Haters gotta hate. The Seattle-Tacoma MSA actually includes King, Pierce and Snohomish Counties. I think it is a little greedy to say all of this is “Seattle”. People in Tacoma certainly do not think of themselves as “Seattleites”. It’s not like they measured the Sea-Tac MSA against something other than other cities’ MSAs. People in Oakland and Hayward don’t consider themselves San Franciscans either, but their part of the MSA. Something about the weather around here makes it impossible for us to pat ourselves on the back.